Soaring beams, sliding walls of glass and sweeping clerestory windows…the long clean lines of this beautiful post and beam home combine the easy living of the mid-century era with all the amenities of the modern age. 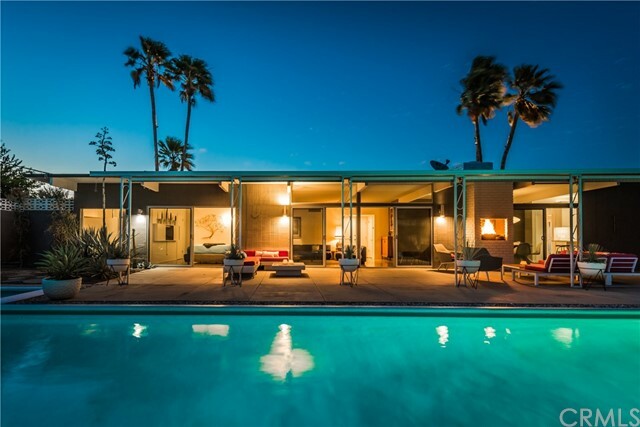 Built in 1957 by renowned developer Jack Meiselman, this home’s iconic architecture is wonderfully preserved, while thoughtful contemporary updates modernize all 3 sleek bathrooms and the fully remodeled open concept kitchen with bar and adjacent dining area. Boasting 3 bedrooms and an attached but private 4th bedroom and studio lounge, there’s ample room to relax in classic Palm Springs style. Embracing the outdoors, all main living areas seamlessly flow to the spacious private yard. Through the updated sliders, discover the spectacular newly tiled, plastered and plumbed 48 foot swimming pool, outdoor fireplace, and multiple lounging areas in the sun, under the veranda, or beneath the shade of the Carob trees. Other amenities and upgrades include an outdoor shower and updated HVAC, electrical, plumbing, landscaping, and front driveway/entry. Complete with stunning views of Mt. San Jacinto from the pool and most living areas, this rare Movie Colony East home is a Desert Star.